Who would dominate American culture--the modernists or the traditionalists? Journalists were looking for a showdown, and they found one in a Dayton, Tennessee courtroom in the summer of 1925. There a jury was to decide the fate of John Scopes, a high school biology teacher charged with illegally teaching the theory of evolution. The guilt or innocence of John Scopes, and even the constitutionality of Tennessee's anti-evolution statute, mattered little. The meaning of the trial emerged through its interpretation as a conflict of social and intellectual values. William Jennings Bryan, three-time Democratic candidate for President and a populist, led a Fundamentalist crusade to banish Darwin's theory of evolution from American classrooms. Bryan's motivation for mounting the crusade is unclear. It is possible that Bryan, who cared deeply about equality, worried that Darwin's theories were being used by supporters of a growing eugenics movement that was advocating sterilization of "inferior stock." More likely, the Great Commoner came to his cause both out a concern that the teaching of evolution would undermine traditional values he had long supported and because he had a compelling desire to remain in the public spotlight--a spotlight he had occupied since his famous "Cross of Gold" speech at the 1896 Democratic Convention. Bryan, in the words of columnist H. L. Mencken, who covered the Scopes Trial, transformed himself into a "sort of Fundamentalist Pope." By 1925, Bryan and his followers had succeeded in getting legislation introduced in fifteen states to ban the teaching of evolution. In February, Tennessee enacted a bill introduced by John Butler making it unlawful "to teach any theory that denies the story of divine creation as taught by the Bible and to teach instead that man was descended from a lower order of animals." 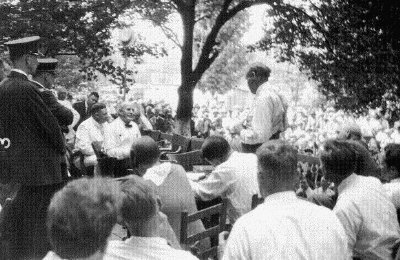 The Scopes Trial had its origins in a conspiracy at Fred Robinson's drugstore in Dayton. George Rappalyea, a 31-year-old transplanted New Yorker and local coal company manager, arrived at the drugstore with a copy of a paper containing an American Civil Liberties Union announcement that it was willing to offer its services to anyone challenging the new Tennessee anti-evolution statute. Rappalyea, a modernist Methodist with contempt for the new law, argued to other town leaders that a trial would be a way of putting Dayton on the map. Listening to Rappalyea, the others--including School Superintendent Walter White--became convinced that publicity generated by a controversial trial might help their town, whose population had fallen from 3,000 in the 1890's to 1,800 in 1925. The conspirators summoned John Scopes, a twenty-four-year old general science teacher and part-time football coach, to the drugstore. As Scopes later described the meeting, Rappalyea said, "John, we've been arguing and I said nobody could teach biology without teaching evolution." Scopes agreed. "That's right," he said, pulling a copy of Hunter's Civic Biology--the state-approved textbook--from one of the shelves of the drugstore (the store also sold school textbooks). "You've been teaching 'em this book?" Rappalyea asked. Scopes replied that while filling in for the regular biology teacher during an illness, he had assigned readings on evolution from the book for review purposes. "Then you've been violating the law," Rappalyea concluded. "Would you be willing to stand for a test case?" he asked. Scopes agreed. He later explained his decision: "the best time to scotch the snake is when it starts to wiggle." Herbert and Sue Hicks, two local attorneys and friends of Scopes, agreed to prosecute. Rappalyea initially wanted science fiction writer H. G. Wells to head the defense team. "I am sure that in the interest of science Mr. Wells will consent," Rappalyea predicted. Wells had no interest in taking the case, but others did. John Neal, an eccentric law school dean from Knoxville, drove to Dayton and volunteered to represent Scopes. When William Jennings Bryan offered to join the prosecution team--despite having not practiced law in over thirty years--, Clarence Darrow, approaching seventy, jumped to join the battle in Dayton. Darrow was not the first choice of the ACLU, who was concerned that Darrow's zealous agnosticism might turn the trial into a broadside attack on religion.The ACLU first preferred former presidential candidates John W. Davies and Charles Evans Hughes, but neither was willing to serve alongside Darrow. Instead, it dispatched Arthur Garfield Hays, a prominent free speech advocate, to join the defense team. The final member of the defense team was Dudley Field Malone, an international divorce attorney (and another volunteer who the ACLU might have preferred to stay at home). Completing the prosecution team in Dayton were present and former attorneys general for Eastern Tennessee, A. T. Stewart and Ben B. McKenzie, and Bryan's son, federal prosecutor William Jennings Bryan, Jr. Time has a way of simplifying events and today Darrow and Bryan are remembered as the key adversaries in the trial, even though Hays for the defense and Stewart for the prosecution played equally important roles at the trial. A carnival atmosphere pervaded Dayton as the opening of the trial approached in July of 1925. Banners decorated the streets. Lemonade stands were set up. Chimpanzees, said to have been brought to town to testify for the prosecution, performed in a side show on Main Street. Anti- Evolution League members sold copies of T. T. Martin's book Hell and the High School. Holy rollers rolled in the surrounding hills and riverbanks. Nearly a thousand people, 300 of whom were standing, jammed the Rhea County Courthouse on July 10, 1925 for the first day of trial. (Judge John T. Raulston, the presiding judge in the Scopes Trial, had proposed moving the trial under a tent that would have seated 20,000 people). Also in attendance were announcers ready to send to listeners the first live radio broadcast from a trial. Judge Raulston, a conservative Christian who craved publicity, was flanked by two police officers waving huge fans to keep air circulating. The proceedings opened, over Darrow's objections, to a prayer. A jury of twelve men, including ten (mostly middle-aged) farmers and eleven regular church-goers, was quickly selected. The trial adjourned for the weekend. On Sunday, William Jennings Bryan delivered the sermon at Dayton's Methodist Church. He used the occasion to attack the defense strategy in the Scopes case. As Bryan spoke, Judge Raulston and his entire family listened attentively from their front pew seats. On the first business day of trial, the defense moved to quash the indictment on both state and federal constitutional grounds. This move was at the heart of the defense strategy. The defense's goal was not to win acquittal for John Scopes, but rather to obtain a declaration by a higher court--preferably the U.S. Supreme Court--that laws forbidding the teaching of evolution were unconstitutional. (That goal, however, would not be realized for another 43 years, in the case of Epperson v. Arkansas ). As expected, Judge Raulston denied the defense motion. Opening statements pictured the trial as a titanic struggle between good and evil or truth and ignorance. Bryan claimed that "if evolution wins, Christianity goes." Darrow argued, "Scopes isn't on trial; civilization is on trial." The prosecution, Darrow contended, was "opening the doors for a reign of bigotry equal to anything in the Middle Ages." To the gasps of spectators, Darrow said Bryan was responsible for the "foolish, mischievous and wicked act." Darrow said that the anti-evolution law made the Bible "the yardstick to measure every man's intellect, to measure every man's intelligence, to measure every man's learning." It was classic Darrow, and the press--mostly sympathetic to the defense--loved it. The prosecution opened its case by asking the court to take judicial notice of the Book of Genesis, as it appears in the King James version. It did. Superintendent White led off the prosecution's list of witnesses with his testimony that John Scopes had admitted teaching about evolution from Hunter's Civic Biology. Chief Prosecutor Tom Stewart then asked seven students in Scope's class a series of questions about his teachings. They testified that Scopes told them that man and all other mammals had evolved from one-celled organism. Darrow cross-examined--gently, though with obvious sarcasm--the students, asking freshman Howard Morgan: "Well, did he tell you anything else that was wicked?" "No, not that I can remember," Howard answered. After drugstore owner Fred Robinson took the stand to testify as to Scope's statement that "any teacher in the state who was teaching Hunter's Biology was violating the law," the prosecution rested. It was a simple case. On Thursday, July 16, the defense called its first witness, Dr. Maynard Metcalf, a zoologist from the Johns Hopkins University. The prosecution objected, arguing that the testimony was irrelevant to Scopes' guilt or innocence under the statue. Before ruling the prosecution's evidence, Judge Raulston decided to hear some of Dr. Metcalf's testimony about the theory of evolution. The testimony evoked Bryan's only extended speech of the trial. Bryan mocked Metcalf's exposition of the theory of evolution, complaining that the evolutionists had man descending "not even from American monkeys, but Old World monkeys." Dudley Malone countered for the defense, arguing in a thundering voice that the prosecution's position was borne of the same ignorance "which made it possible for theologians...to bring Old Galilee to trial." It was a powerful speech. Anti-evolution lawmaker John Butler called it "the finest speech of the century." Members of the press gave Malone a standing ovation and most courtroom spectators joined in the sustained applause. The next day, Raulston ruled the defense's expert testimony inadmissible. Raulston's ruling angered Darrow. He said he could not understand why "every suggestion of the prosecution should meet with an endless waste of time, and a bare suggestion of anything that is perfectly competent on our part should be immediately overruled." Raulston asked Darrow, "I hope you do not mean to reflect upon the court?" Darrow's reply: "Well, your honor has the right to hope." Raulston responded, "I have the right to do something else." The insult earned Darrow a contempt finding, which was later dropped when Darrow, to a big hand from spectators, apologized for his remark. Darrow and Raulston shook hands. After expressing concern that the courtroom floor might collapse from the weight of the many spectators, Raulston transferred the proceedings to the lawn outside the courthouse. There, facing the jury, hung a sign--attached to the courthouse wall-- reading, "Read Your Bible." Darrow asked either that the sign be removed or that a second sign of equal size saying "Read Your Evolution" be put up along with it. Raulston ordered the sign removed. Before a crowd that had swelled to about 5,000, the defense read into the record, for purpose of appellate review, excerpts from the prepared statements of eight scientists and four experts on religion who had been prepared to testify. The statements of the experts were widely reported by the press, helping Darrow succeed in his efforts to turn the trial into a national biology lesson. On the seventh day of trial, Raulston asked the defense if it had any more evidence. What followed was what the New York Times described as "the most amazing court scene in Anglo-Saxon history." Hays asked that William Jennings Bryan be called to the stand as an expert on the Bible. Bryan assented, stipulating only that he should have a chance to interrogate the defense lawyers. Bryan, dismissing the concerns of his prosecution colleagues, took a seat on the witness stand, and began fanning himself. Darrow began his interrogation of Bryan with a quiet question: "You have given considerable study to the Bible, haven't you, Mr. Bryan?" Bryan replied, "Yes, I have. I have studied the Bible for about fifty years." Thus began a series of questions designed to undermine a literalist interpretation of the Bible. Bryan was asked about a whale swallowing Jonah, Joshua making the sun stand still, Noah and the great flood, the temptation of Adam in the garden of Eden, and the creation according to Genesis. After initially contending that "everything in the Bible should be accepted as it is given there," Bryan finally conceded that the words of the Bible should not always be taken literally. In response to Darrow's relentless questions as to whether the six days of creation, as described in Genesis, were twenty-four hour days, Bryan said "My impression is that they were periods." Bryan, who began his testimony calmly, stumbled badly under Darrow's persistent prodding. At one point the exasperated Bryan said, "I do not think about things I don't think about." Darrow asked, "Do you think about the things you do think about?" Bryan responded, to the derisive laughter of spectators, "Well, sometimes." Both old warriors grew testy as the examination continued. Bryan accused Darrow of attempting to "slur at the Bible." He said that he would continue to answer Darrow's impertinent questions because "I want the world to know that this man, who does not believe in God, is trying to use a court in Tennessee--." Darrow interrupted his witness by saying, "I object to your statement" and to "your fool ideas that no intelligent Christian on earth believes." After that outburst, Raulston ordered the court adjourned. The next day, Raulston ruled that Bryan could not return to the stand and that his testimony the previous day should be stricken from evidence. The confrontation between Bryan and Darrow was reported by the press as a defeat for Bryan. According to one historian, "As a man and as a legend, Bryan was destroyed by his testimony that day." His performance was described as that of "a pitiable, punch drunk warrior." Darrow, however, has also not escaped criticism. Alan Dershowitz, for example, contended that the celebrated defense attorney "comes off as something of an anti-religious cynic." The trial was nearly over. Darrow asked the jury to return a verdict of guilty in order that the case might be appealed to the Tennessee Supreme Court. Under Tennessee law, Bryan was thereby denied the opportunity to deliver a closing speech he had labored over for weeks. The jury complied with Darrow's request, and Judge Raulston fined him $100. Six days after the trial, William Jennings Bryan was still in Dayton. After eating an enormous dinner, he lay down to take a nap and died in his sleep. Clarence Darrow was hiking in the Smoky Mountains when word of Bryan's death reached him. When reporters suggested to him that Bryan died of a broken heart, Darrow said "Broken heart nothing; he died of a busted belly." In a louder voice he added, "His death is a great loss to the American people." The Scopes trial by no means ended the debate over the teaching of evolution, but it did represent a significant setback for the anti-evolution forces. Of the fifteen states with anti- evolution legislation pending in 1925, only two states (Arkansas and Mississippi) enacted laws restricting teaching of Darwin's theory.